Ancol Ergo Soft Dog Brush has been developed with an ergonomic grip for comfortable and easy use. Designed especially for the delicate coats of puppies, the Soft Dog Brush is also suitable to use around other delicate areas such as the face and ears of adult dogs. 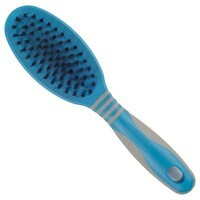 The soft nylon bristles will gently stimulate your puppies skin as well as collecting any debris or loose hairs. They will also stimulate the natural oil in the hairs themselves, giving your pet a fuller, healthier looking coat. Grooming your puppy, or even adult dog, is important to both of you and will help your relationship strengthen and grow. For more information on grooming your pet please take a look at the information on the back of the products packaging.